The first pattern is Homecoming in which we ask; where is home and how do we find our way there? Most of our leadership metaphors are focused on growing up and upward mobility and the ladder of success. What if we balanced this upward organic motion with also growing down. To grow down is to have an embodied experience of place and become native to the ground we find ourselves on. We have a curriculum for upward mobility; we need a parallel curriculum for homecoming – including making fertile the places we find ourselves. To come home to ourselves is to find our own personal myth and rediscover how our enchantment with nature, art and community connects us with the whole of life. During a recent six-day retreat where we explored the soul of place we listened to the voices of participants express their hopes in a spirit of homecoming and welcome. Towards the end of our sharing we observed that our words felt distant and abstract. Later in the morning, when participants each shared an offering in the form of a project, story or question they wished to offer the group, we did so outside in nature on the rocks, among the trees or by the water. And each spoke at a time and place of their choosing while standing and feeling the ground beneath their feet. Images of digging in the dirt, making fertile ground, building soil and creating a home for new and fragile ideas guide us towards finding our deeper identity through place in ways that make visible the spirit and story of this place. So in the pattern of homecoming we may ask: what is this place asking of me? what is my gift and what am I uniquely called to do? How can I set a context for others to understand my perspective and what can I learn from noticing the felt life that is unfolding within my own interior landscapes of place? The second pattern is Belonging in which we ask; what is the nature of our relationship with the people and places that we hold sacred? The urge to belong to a place is basic to the tissue that connects all of life – a pattern of aliveness that brings us into alignment with the ecology of nature and discovering how nature thinks. And in nature everything belongs to everything else. Belonging involves re-imagining our world to include; a new network, a sacred circle of relationship, and the connective tissue of life-giving relationships that align us to the essence of nature and how nature works and connects. How do our sacred relationships connect us to other communities? What would it mean for our perspective to become more global and inclusive of the stranger and not just our tribe? How do I belong to this place in ways I don’t belong anywhere else? How can I embrace diversity both within my community and with life in its largest sense? The third pattern is one of Regenerativity. To be regenerative is to be committed to the conscious evolution of life. It involves a shift in focus from problem solving and making the visible, actionable to sensing patterns of flow and relationship that make the invisible, visible. In so doing we create beauty through seeing all that we do as a form of craft and embracing craftsmanship as the expression of place through the hands and the heart as well as the mind. To be regenerative is to act and, at the same time, to also be acted upon. To be moved to create through forces greater than ourselves is what connects regenerative action to the local conditions and other resources found in the places themselves. Therefore to be regenerative is to ask; what is the nature of the place that I am creating from? What is the tone of this place and how as a leader do I want to carry this tone for both myself and others? What can we create together? Where are the places we go to find beauty and how can we fill a space in a beautiful way? The fourth pattern is Carnival which includes engaging the life generating forces of ritual and transformative celebration. Whenever we gather together and enliven the senses through art, music, storytelling, poetry and movement we are evoking the Carnival spirit. Carnival is the upturning of the established order and – like the bright green blades of grass rising up through concrete – making a place in the world for the raw unformed impulse of life to burst through.The sense of gathering together on the public square or in the commons, bringing together diverse energies, expressing the democratic spirit and upturning the old for the new are a catharsis of this energy. It represents a third force reinstating our sense of home for ourselves in the larger world and in the universe. The primary question underlying the book The Soul of Place is: if we are entering the biological age in which our primary work is to come alive to community, to the creative spirit, to nature and ecology and with the soul of place where we find it – then what is it that causes life to wither or to flourish? And the answer may be that life flourishes when our focus shifts from absolute truth to inner truth, from separation and isolation to connection, from efficiency and control to trust in the regenerativity of life and from scarcity and limits to abundance and joy. With homecoming our deference to external authority, absolute truth and the need for perfection shifts to valuing our own authenticity, including the wisdom to lead from the place within us that includes our gifts and the wisdom of our own inner nature. The belief in separation shifts to the search for belonging and an empathic resonance with our world, including an appreciation for our connection to home, to nature, to local wisdom and to who we essentially are. The focus on efficiency and control shifts toward a trust in the conscious evolution of life including the sense that we can approach life’s challenges with grace and ease and an appreciation for life’s natural unfolding and a willingness to let go and let be. And the belief in scarcity shifts to an appreciation that, while we may need to work within certain limits, the natural world bursts forth based on the principle of abundance and so is replenished, not diminished, by our efforts. Furthermore, when our work is aligned with nature, we not only sustain life, we create life. When we deepen our relationship with place through nature, art and community we also steward the discovery and articulation of an overarching collective mythic narrative of place that brings these patterns of place alive. Most leaders don’t want to only belong to a job or even a career. They want to belong to a story, and particularly to a story that is mythic in its possibilities and place-based. Too often the places we create remain placeless because they don’t include our stories. So nurturing these patterns of life and the fabric of the larger mythic narrative that holds them begins with coming together and telling our stories. Recounting these larger than life narratives of place is itself an act of joyous celebration and part of the leaders’ emerging work as stewards and placemakers. The Sufi Poet Jalauddin Rumi once wrote; “wherever you stand be the soul of that place.” When we stand in the felt experience of our own homecoming and align with the flow of life, the soul of place will blaze up once again and we will stand in our new life with the fire of faith. 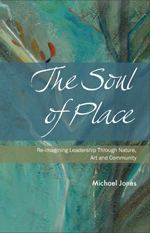 This entry was posted in Placebased Leadership, Soul of Place and tagged belonging, homecoming, mythic narratives, regeneravity, transformative celebration. Bookmark the permalink.